Deadline for application with preliminary topic and author’s info: 01 March 2018. Deadline for proposal and visa invitation documents: 1 March 2018. Deadline for papers: 1 April 2018. 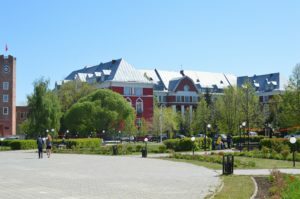 The conference will be held as a part of the Perm Natural Science forum. Scientific Conference with international participation «Natural Science Methods in the Digital Humanitarian Environment» will take place at the Perm State National Research University (PGNIU) on May 15-18, 2018, within the framework of the Perm Natural Science Forum «Science and Global Challenges of the 21st Century». The conference is held by the Center for Digital Humanities of Perm University in cooperation with the Russian Association for Digital Humanities with the support of the Ministry of Education and Science of Perm Region. The purpose of the conference is to discuss the application of information technologies in the preservation, study and representation of historical and cultural heritage, the exchange of experience and the identification of the needs for the development of the digital environment for society, science and GLAM institutions. Studying of historical and cultural heritage, natural-science methods of analysis, formats and models of information’ representation in the humanities. Preservation of historical and cultural heritage, technologies of digitization of various types objects. Institutions for the storage of historical and cultural heritage and national memory in the digital age. Digital archives, museums, libraries. VR / AR technologies, virtual museums, representation of museum space in a virtual environment. 3D-modeling and reconstruction of historical and cultural sites. Textual heritage: formats, visualization, computer linguistics, textology and textometry. Tangible and intangible cultural heritage: study, preservation and representation in the digital environment. Digital arts, electronic literature, art practices. Digital Art as an element of cultural heritage. Multidisciplinarity and cooperation of educational and scientific organizations, storage institutions and IT companies. New competencies and training specialists in digital humanities. Presentation of projects and resources. We invite scientists, teachers, young researchers, employees of museums, archives, libraries and other cultural institutions, developers of information resources and representatives of the IT industry to participate in the event. To participate in the conference it is necessary to send an application by March 30, 2018 by e-mail to histlab@gmail.com. The application requires the topic of the report and information about author (degree, rank, place of work, current position, email). Abstracts in Russian or English are accepted until April 1, 2018 by e-mail histlab@gmail.com. Papers maximum volume is up to 5000 characters, including spaces (preferably without tables, diagrams and illustrations). The template for abstracts is available on the conference website. All the theses will be reviewed. The Program Committee reserves the right to reject the abstracts. The results of the review will be announced by April 20, 2018. The abstracts of papers will be published in the Conference Proceedings before the beginning of the conference. Venue of the conference: 614990, Perm, Bukirev str., 15, Perm State University. Conference site: dhconf.ru. Information about the conference is also available on the website of the Center for Digital Humanities of Perm University dh.psu.ru. If you need a visa to visit Russia, please fill and sign the application form, assure the signature by a stamp of the organization where you work. Send the digital copy of this form (scan) and the digital copy of the first page of your passport to histlab@gmail.com till 1 of March 2018. These documents are required for registration of a formal invitation, which is necessary for visa to Russia. If you have any difficulties in filling out the application form or its translation, please write to histlab@gmail.com.